There are several breeds of golden dogs, for instance Golden Retriever, Vizsla, Hovawart, and Tolling Retriever. These golden breed dogs are bright and sunny, and they will bring you happiness and pleasure by their stunning color. 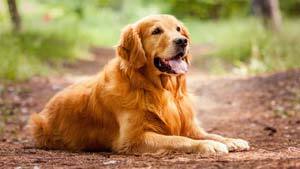 Golden dogs deserve golden names, and we have gathered several golden dog names from nature. These 14 cool dog names will be perfect for your newborn puppies, and they are all suitable for your friendly and happy dogs. Amber: Amber is used to describe the gem's golden color, and the name Amber is perfect for those female puppies with darker orange coats. Blondie: Brownie made without chocolate, perfect for puppies of blond color. Also an American rock band founded by singer Debbie Harry and guitarist Chris Stein. Citrus: Citrus is a genus of flowering plants including the orange and lemon. This natural dog name will remind you of your favorite fruits. Clementine: Clementine is another sweet citrus fruit, and it is a sweet and old-fashioned dog name. Because Clementine is a small fruit, so this name could be perfect for your petite puppies. There is also a well-known song called "Oh My Darling Clementine". Honey: Honey may vary in color between pale yellow and dark brown, and nothing is sweeter than Honey. Leo: Leo is the Latin word for lion, and lion colouration varies from light buff to yellowish, reddish, or dark ochraceous brown. Maize: large grain plant domesticated by indigenous peoples. Mango: Mango is a sweet and juicy tropical fruit, the ripe fruit color is usually yellow, orange or red. Mango is a cute sweet name for your orange puppy smell sweet. Marigold: a plant in the genus Calendula of the family Asteraceae. Pumpkin: A pumpkin is round, with smooth, slightly ribbed skin and deep yellow to orange coloration. The name Pumpkin is ideal for those lazy dogs with a plush and round tummy. Sunny: Sunny means sunshine, and it express a happy and cheerful temperament. Your dog named Sunny would just make everyone happy and smile. Tangelo: A Tangelo is a delicious combination of a grapefruit and a tangerine. If you want to give your orange dog a unique name, try Tangelo to express their sweetness and preciousness. Tangerine: The tangerine is an orange-colored citrus fruit, people love it because it is a smaller fruit full of flavor. Try this name for your petite dog with loads of personality.